Keeping track of an inventory of small parts is no small task. Using a counting scale is one way to ensure the process runs more smoothly, but many counting scales are not capable of providing the high level of accuracy needed in certain situations. When using counting scales, inaccuracies can occur and most often happen when determining the weight of the sample piece or pieces. An inaccurate sample weight can cause your inventory counts to be off significantly. How Inaccurate Could the Sample Weight Really Be? Let’s say that you’re using a scale that has a 100-lb. capacity and a resolution of 0.02 lb. If you have a sample weight of .03141 lb. and the sample size consists of 10 pieces, the result will be .3141 lb. The problem is that the scale in this scenario is only able to read to its best resolution, which is only .31 lb. This creates a fairly significant error, which could be avoided with a counting scale that offers a higher resolution. With a SAW-C scale from Arlyn Scales, you’ll have the same capacity of the 100 lbs. mentioned in the example above, but your resolution will be 0.001 lb. If we use the same sample weight (.03141 lb.) and sample size (10 pieces), the scale will then read .314 lb., which is much more accurate. You may be asking how Arlyn Scales is able to offer such high resolution without sacrificing capacity? The answer lies in our patented surface acoustic wave (SAW) technology, which is a complete redesign of the load cell system utilized in most counting scales on the market today. Most scales use load cells, which are transducers that utilize a steel or aluminum spring element attached to the underbelly of a scale’s platform at one end and the base of the scale at the other end. Connected to the flexures of this spring element are four strain gages connected together to form what’s called a Wheatstone’s bridge. When weight is applied to the scale platform, the spring bends. The degree of bend is directly proportional to the weight that is being applied to the scale platform. When the spring element bends, so do the flexures, which causes a change in the strain gage resistance. This resistance change in turn, alters the voltage output of the bridge, which is then passed through a converter that takes the analog signal and outputs a digital signal that is then sent to the digital display to display the weight. One error with this approach pertains to the adhesive used to attach the strain gages to the spring element inside the scale, as it can cause accuracy problems when weight measurements are taken. This error can affect the flexibility of the spring and prevent it from being able to generate a high-resolution weight measurement. Strain gages are also commonly affected by temperature changes and can be subject to deformation from overloading and shock, which are two common causes of scale failure. Our SAW counting scales are easily distinguishable compared to competing models due to their durability and high-resolution measurements, even in extreme, industrial environments. Rather than measuring the strain placed on a spring element (like strain gage scales), our scales measure displacement using two of our patented SAW transducers. This allows our measurements to be much more accurate than when using standard strain gage scales. In fact, our scales offer more accurate measurements with strain levels that are less than 10% of those found with typical strain gage scales. 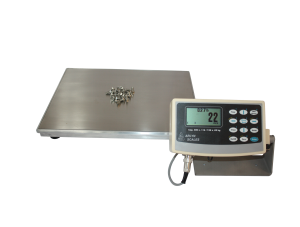 This also allows our scales to be much more durable and reliable because they have such a high overload capacity. This ruggedness is one of the main reasons why our scales are much more resistant to overloading and shock loading, which as mentioned above, are common causes of scale failure. While our SAW scale technology does feature a spring element, that’s where the similarities end. The substrate of our SAW transducers is composed of a crystalline structure made of lithium niobate. Our transducers create a bulk wave by a metalized pattern acting as a transmitter that is sent through the substrate. The wave then travels the full length of the transducer to generate an equivalent signal, which travels on a parallel substrate. A second metallized pattern located on the second substrate acts as a receiver. The measure of distance between the transmitter and receiver is what is used to determine the frequency of the wave’s oscillation. This frequency is then proportional to the displacement of the spring element. With our Ultra Precision SAW scales, this frequency is measured digitally, making our scales much more accurate than competing scales that must convert an analog signal into a digital signal to be displayed. Typical strain gage scales have readability readings of 1:5000, whereas our SAW scales have readability readings of 1:100,000, making them twenty times as accurate. Inventory data is of little use if it cannot be analyzed instantly. With our scales, you have a variety of communication options including USB, WiFi, Ethernet, RS-232, Cloud and more, all of which allow you to easily distribute your weight data to as many devices as necessary within your organization. Using our counting scales enables you to use our Quick Count feature, which allows you to easily count parts without the confusing menus found with other scale manufacturers. Once you’ve obtained a sample for a certain part, you can then store this value for future use. Our scales can hold as many as 100 different piece weights, which can save significant time if you’re weighing a large number of different items. At Arlyn Scales, we design and manufacture all of our scales in our Long Island, NY factory. This allows you to get a higher quality product at an extremely competitive price point. Our factory direct approach also allows our team to easily design and manufacture custom scale solutions for our clients. Whether you need a certain platform size, communication method or any other feature, we’re confident that we can help you meet your financing needs GT installment loans no credit check. Reach out to Arlyn Scales Today! If you have any questions about our counting scales or our revolutionary SAW technology, don’t hesitate to give us a call today at 1-800-645-4301.